Disclosure: This is the fourth book in The Lost Fleet and I’ll refer to several events that took place in the previous three books but that I did not include in those reviews to avoid major spoilers. In the previous book, Courageous, the fleet fought the Syndics in a battle that didn’t go too well and then, against all expectations, in the very last pages, Captain Black Jack Geary decided to return to that battlefield to catch the enemy by surprise. This suggested that in Valiant we would see a more daring Geary fighting even more desperate battles. Not yet. In Valiant, there is actually less space fighting but more discoveries and introspection. We learn more about the Syndics, and the hypernet gates, and the mysterious third party, and we get a closer look at some of the characters. When I reviewed Dauntless, I said that one of the female characters was “so easy to hate” that I dedicated a couple of paragraphs to her. In the second book Victoria Rione didn’t improve at all but she became Geary’s confidant and mistress anyway. Then in Courageous, she learnt that her husband might still be alive. Then, all of a sudden, the coldhearted Rione had a serious case of shameful regret, she retreated to her quarters avoiding Geary but never hurried to tell him what was going on inside her troubled head and heart. By that time, Rione had realized also that Geary and Captain Tanya Desjani were meant for each other, even though Geary was still completely clueless about this. This, of course, clears the way for Desjani. Except that honorable Desjani would never jump into bed with his superior officer, no matter how much she wants to. So, once again, we get not-so-subtle clues and hints to what we can expect in the next books. Namely, Geary will come back home to Alliance space as the victorious hero that won the war (or did very much to win it), he’ll retire to a quiet place. And that quiet place will be none other than Desjani’s home planet so, obviously, Desjani will be his feminine icing on the cake. However, by the end of Valiant, Campbell shows us something about the loyal female captain that sounds just too much like Rione and not at all what we’ve seen from Desjani. It has to be the aliens! In the previous books, the fleet discovered that “someone” had taken “something” from a long-abandoned Syndic planet. Campbell tells us that “they” used a very unusual drill to open the vault. And so, of course, it has to be aliens. It’s not like the feet Marines ran into some traces of alien DNA, or weird looking footprints, or found footage showing little green men. No, it’s just that the guys who broke into the Syndic base used a type of drill that no one had seen before. It could be that the Syndics have a type of drill that the Alliance is not familiar with. After all, the Alliance fleet knows very little about what is going on with the Syndics, to the point that they do not even know the toponyms (or even the names of the planets) of the enemy space they are passing through. But somehow we have to believe that they know that the Syndics do not have that type of drill. Regrettably, in Valiant, Campbell gives us some more it-has-to-be-aliens non sequitur. Aside from his odd affaire with Rione, Geary is not easily tempted. Badaya, one of the loyal captains, has already hinted that Black Jack Geary would enjoy ample support if he were inclined to become a military dictator upon returning to Alliance space. But our hero remains honorable and true to his oath. New political enemies have appeared to cause trouble and have no problem playing dirty. But they are not as clever as the ones that Geary had to face in the first books. And Geary has scored enough victories to earn the trust of the majority of the captains and crews. It looks very much like political obstacles will not be a problem—at least, not while the fleet is still in Syndic space. 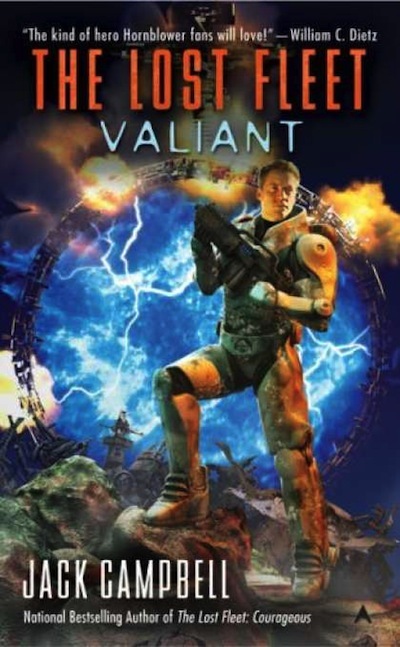 By the end of Valiant, it looks very much like Campbell has set everything in place for the last two books to be stuffed with fiercely desperate battles, political intrigue, and some teasing romantic tension.